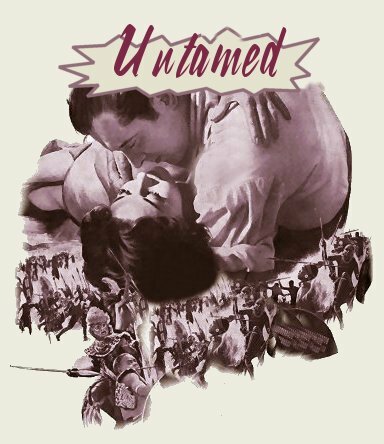 The potent mixture of uncomparable spectacle, unforgettable adventure and untamed love brewed to match the wildest continent on earth have created the latest motion picture excitement, "Untamed", starring Tyrone Power, Susan Hayward, and Richard Egan. The Twentieth Century-Fox offering promises to be the big African spectable CinemaScope was inevitably slated to make. The inexhaustible eye of its anamorphic lens has been allowed to roam the African plains, penetrate its jungles and mountains; slip past the guard of natives and hostile animals into territory never before glimpsed by the outside world. Based on Helga Moray's novel of "the Great Trek", when the Boer settlers tried to colonize in the diamond country of South Africa 100 years ago, and written for the screen by top scenarist trio Talbot Jennings, Frank Fenton and Michael Blankfort, the story focus on the fiery romantics, a Boer commando leader and a tempestuous Irish beauty played by Tyrone Power and Susan Hayward. The headstrong pair meet first in Ireland where Power purchases new mounts for his troop and again, when she persuades the man she later marries to bring her and their child to South Africa. There the old love blazes anew amidst wagon train hardships in the wild country, Zulu attacks in swarming hordes, and the curdling bullwhip contests for the flame-haired Katie's favors brought about by the girl's designing encouragement of a sinister Boer outsider. Tyrone Power, as the commando leader with dreams of empire building, terminates his 18-year alliance with Twentieth Century Fox in a rather symbolical blaze of glory. From here, the polished performer will test his talents in stage appearances and later in travels to various parts of the globe to produce his own motion pictures. Susan Hayward moves up to "first lady" position at the studio with her winning out over the competitive bids of other top feminine stars to be assigned the meaty role of Katie. "Untamed" will signal the policy that Miss Hayward henceforth will be cast in top vehicles chosen especially for her. 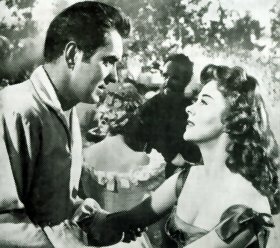 Richard Egan, who first won special plaudits in "Demetrius and the Gladiators," was rewarded with the starring role of the outrider rival to Power for Miss Hayward's affections. John Justin, the English star last seen in "Breaking the Sound Barrier," famed character actress Agnes Moorehead, Rita Moreno, Hope Emerson, Brad Dexter, Henry O'Neill and Paul Thompson lead the important supporting cast. To achieve the spectacular settings, the studio sent a full production crew under the direction of Henry King to South Africa. King established a tent city where the Hollywood filmmakers and 2500 Zulus, rounded up for the battle sequences were housed and fed while preparations for the various battle and outdoor scenes to be filmed in vibrant De Luxe color were worked out according to the visualizations of the films's producing pair, Bert E. Friedlob and William A. Bacher, who were years in developing their plans for this outstanding story of fire and flint.